Manchester United are ready to treble the wages of Tottenham midfield maestro Christian Eriksen as they look to prise the Danish ace away from the north London outfit, according to the Mirror. The newspaper claim on their website that the attacking midfielder is a high priority target for the Red Devils this summer and that they are more than willing to give him a massive wage increase from his current £80,000-a-week at Spurs. It is stated that as well as a mega contract, Manchester United would also have to pay a fee of around £95million to convince Tottenham chief Daniel Levy to sell up, but that Spurs have already started looking for potential replacements, Leicester’s James Maddison reportedly on the shortlist. Not at all. 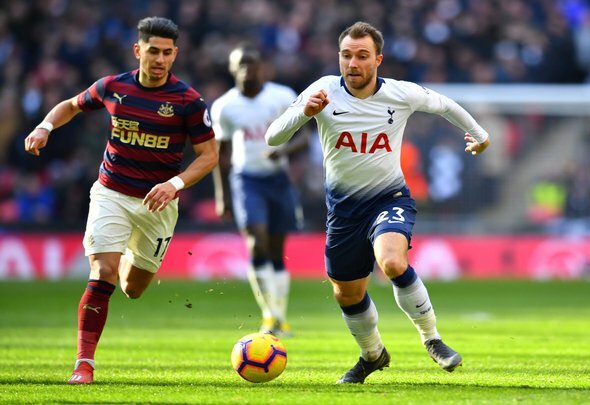 Losing Eriksen would be hard enough but lose him to their rivals in the hunt for a top four Premier League finish would be the worst case scenario. His contract situation is a real problem for Levy, with a year left on his current deal, and if Manchester United are willing to splash out, the only way Spurs will keep him on board is by doing the same. James Maddison is a talented player and would help with filling the club’s required quota for homegrown talent, but it would be a massive ask to take the place of Eriksen next season. The Dane is crucial to the way Spurs play and so you can be sure that the Lilywhites would love to keep him on board. If Eriksen wants to feel valued then you can be sure he will be tempted by the Manchester United mega deal. It would give him the opportunity to continue playing Premier League football while picking up a wage which he feels reflects his talents. You cannot rule this one out this summer.